This book is part of a series of National Trust guidebook for visitors to National Trust Properties. They cover history, horticulture, garden history, history of art, architecture, social history, natural environment, and conservation. 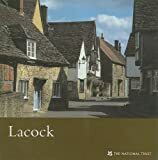 This book looks at Lacock, a small village in Wiltshire, England.